Mani Magic ~ How to Rock This Stylish Trend & Apply Swarovski Crystals As Nail Art! One of the hottest fashion trends is nail art. It has exploded in popularity in the last couple of years and for good reason. Not only is it a stylish way to be creative, most importantly, it’s FUN! Everyone loves to express their own unique style and nail art is a fabulous way to be creative and do just that! There are endless options to create distinctive looks, whether it’s to match your special outfit, get in the mood for different Holidays or just freshen up your everyday look, painting and accessorizing your nails is a perfect way to enhance your individual style! To upgrade your design even further, adding Swarovski Crystal Flat backs to your nails is extremely popular and you can see why, it’s chic and glamorous to enrich your nails with a touch of sparkle. 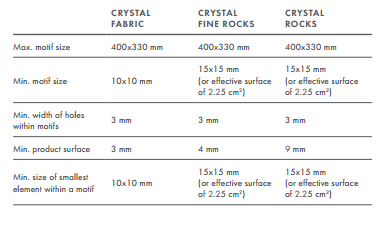 The smaller crystal sizes are ideal for nail art, such as the 2088-10ss and 2088-12ss. 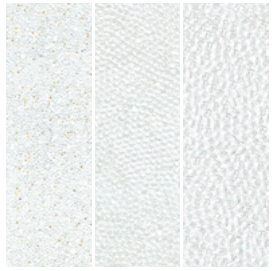 The clear Crystal is especially popular, as it looks very similar to a diamond and the Crystal AB is another favorite, due to the array of yellow, pink and blue rainbow style sparkles. 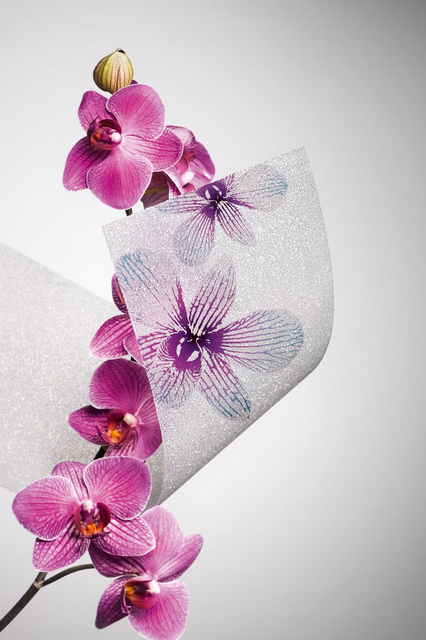 There are also many unique styles to choose from to create a truly personalized design. 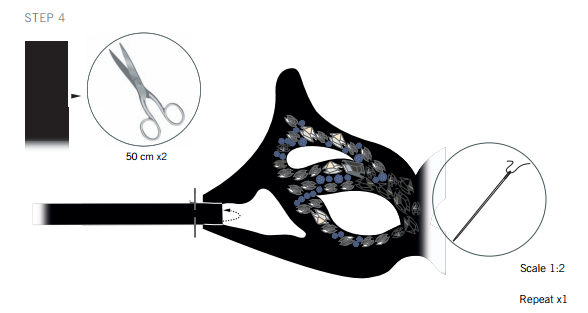 Applying the crystals is very simple when using this amazing tool called the Crystal Katana. 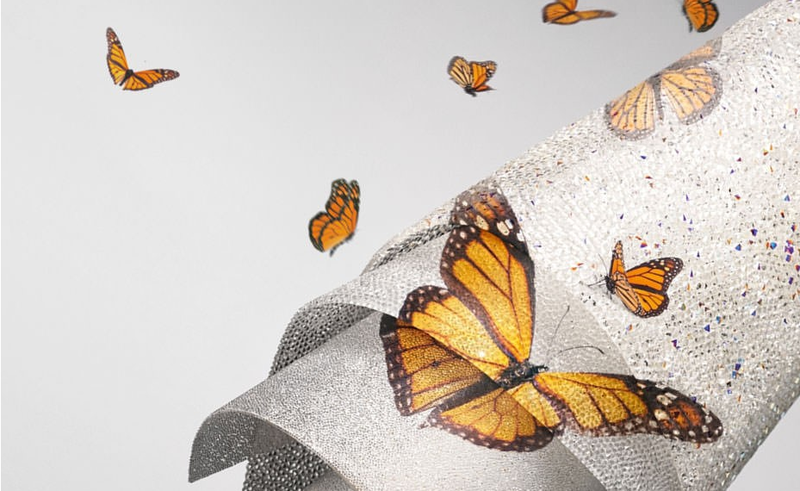 Watch this instructional video on how to apply Swarovski Crystals to your nails. CREATE YOUR STYLE Nail Ambassador demonstrates how to use Swarovski crystals to turn your nails into your newest, most sparkling accessory! Learn the tips and tricks to adding sparkling crystals to your nails on classic nail enamel using nail glue or setting the crystals in the top coat of a gel manicure for long lasting glam! or as decadent as your heart desires! Feel free to post pictures of your own sparkling nail art, I would LOOOVE to see them!! 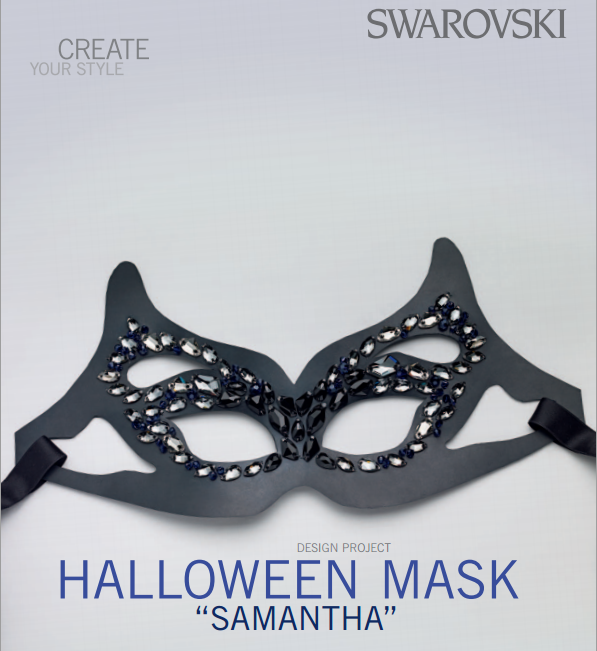 This inky-black mask, studded with Swarovski Crystal Sew-On Stones in tones as dark as night, elevates the humble Halloween costume to a whole new level of glamour and mystery. 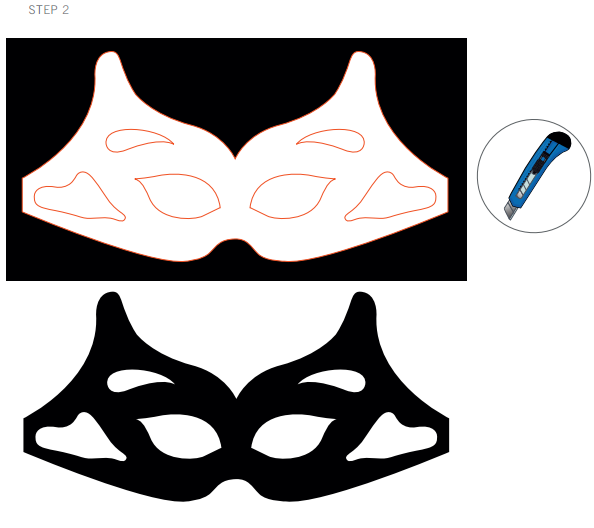 STEP 1: Print and cut out the pattern of the mask in its original size. 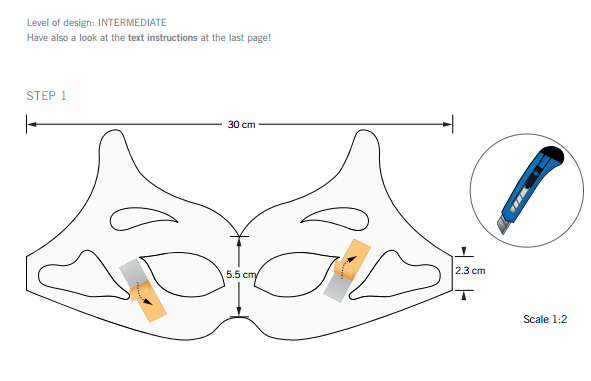 STEP 2: Stick the pattern with double sided tape onto a piece of rubber and cut out the mask shape. 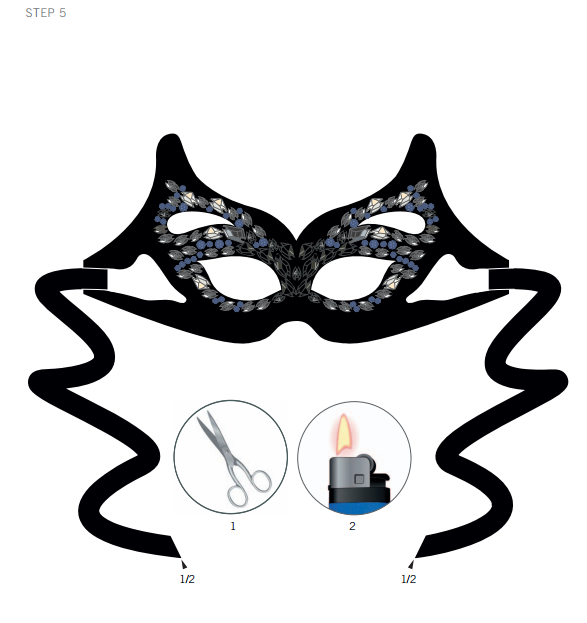 STEP 3: Sew on all Swarovski Beads and Sew-on Stones mentioned in the material list onto the mask as shown in the illustrations. 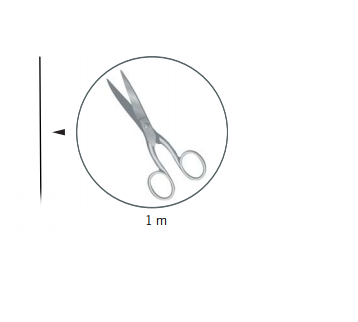 STEP 4: Cut two 50 cm long satin ribbon pieces. Thread these through both the sides of the mask and sew them together individually at each end. STEP 5: Cut off both ends of the ribbon and burn them a little bit with a lighter to secure any loose threads. Hope you have a spooky, sparkling Halloween!! “You’re never over-dressed or under-dressed in a little black dress.” Karl Lagerfeld knows a thing or two about style, so who are we to disagree? This glamorous LBD fits the description perfectly: with Swarovski crystals snaking down from neckline to hem, it’s flattering and endlessly versatile, taking you from desk to drinks, or dinner to dancing. The Swarovski Crystal Beads and Sew-On Stones used to make this dress are just a few styles to choose from the virtual endless shapes, sizes and colors that you can use to create your own personalize style. Supplies include a black dress, and a black button hole silk. 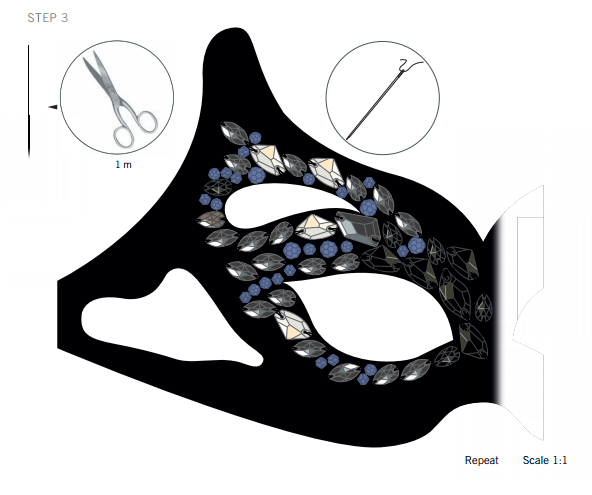 Tools include a beading needle and scissors.